Haha just kidding – it’s totally different. Here’s my guide to Fez! Fez’s Medina is a very different experience to Chefchaouen’s, although similar in it’s Medina design, with the winding alleys, busy cut throughs and of course the smells and delights of Moroccan spices, beauty products and fresh produce available there. But, given it’s the largest car-less area in the world, it’s easy to get lost. Donkeys transport goods across the city, the hundreds of shop keepers are always vying for your attention and there’s a fair bit to see! This was the day Filip and I explored together. 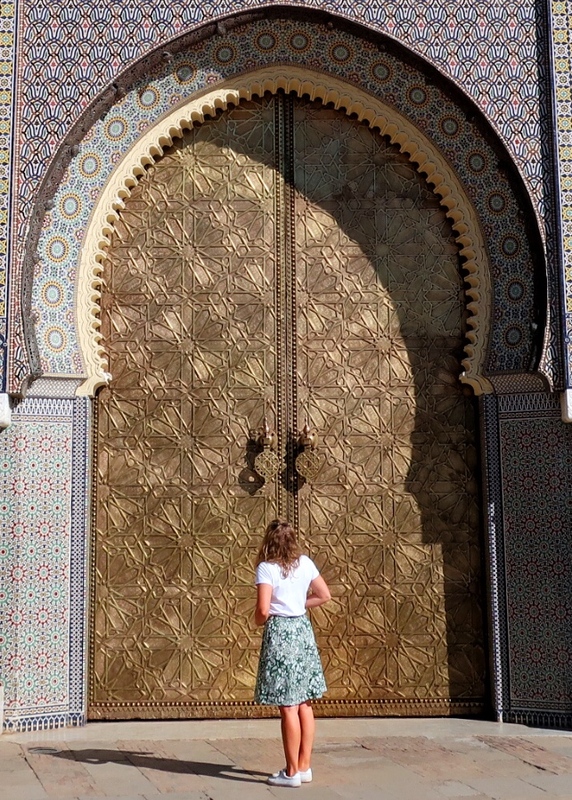 We accidentally acquired a Moroccan guide at our first Madrasa which proved to be a tricky situation. Top tips – many guides will approach you and offer a guide to Fez around the medina so you don’t get lost. We were approached by two, one who wanted 200 MAD and another who promised a free tour. The first guy we politely declined and he headed off to find another punter, our second guide honestly would NOT leave us alone, “free tour, free tour” he promised. It’s best if you don’t make the same mistake as us, although we had a great day, we ended up falling out with him because we a/ didn’t wanna eat in the empty restaurant he took us too, and b/ unsurprisingly (now, I know) it wasn’t a free tour (despite his insistence at the beginning), at the end he wanted 300 MAD. So, ideally if you do fancy a guide, don’t take a free one and make sure they have a proper guide licence – they should have a little card to show you. For easy access to the Médina, definitely stay within its walls, and for a true Moroccan experience stay at a Riad or Riad style building. I chose the Médina Social Club, concealed behind an inconspicuous wooden door, this Riad building was gorgeous inside; coloured tiles adorned the walls and the huge outdoor area in the centre of the building had a small fountain – a beautiful spot for breakfast. Coming from the airport via taxi you have to get dropped off outside the Médina of course and although it looks confusing to get around usually the hotels and hostels have signs everywhere to direct you, or a local can point you the right way. If you have a couple of days in Fez, I would spend a full day exploring the Medina. The hustle and bustle might be overwhelming but it’s all part of the Fez fun. 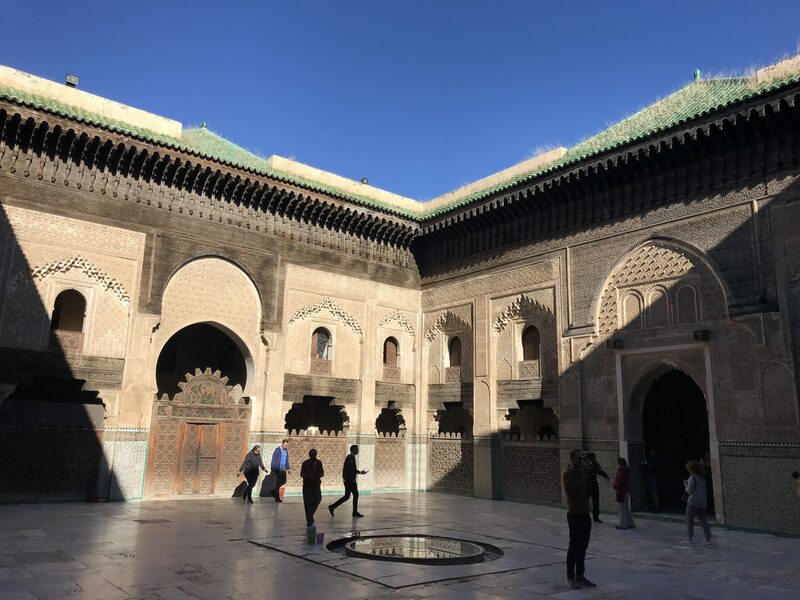 Whilst in the Medina there are a few Mosques you can go inside, notably Al attarine madrasa, Mosque and University Karaouiyne, Mederssa EL Bouanania Fes – but others are used actively which means you’re only able to enter if you’re muslim. Welcome to take a peek inside though. The blue gate marks a main entrance to the Medina and just near to there are a lot of places to eat (keep reading for the recommendations), and the hammam I visited, Hammam Sidi Azouz (see the naked post). The Chouara is a great place for picking up leather goods, as it’s great quality leather and all hand dyed. Although it relatively smelly, you can head to the top of the tannery and see all the leather hides drying out in the sun after their varying levels of colour application. All natural dyes are used for the different colours, saffron for yellow, coal for black, mint for green, poppy for red – pretty cool huh! Outside of the Medina there’s the newer part of the city which has a small community of Jewish people. There’s a massive and gorgeous Royal Palace, and the Synagogue Ibn Danan is a museum, which has great views if you head to the top. During my two days in Fez I mostly dined in the surrounding streets of the blue gate. The restaurants near to there do operate that typical tourist attention grabbing approach with menus and promises of good value – which can be very overwhelming and off putting. We dined in one of these however, and I loved my chicken kebab at Restaurant des jeunes. Outdoor seating meant I could take in the view as the sun got lower through the gate, and I could observe the hustle and bustle of one of the main entrances/exits to the medina. Just around the corner, further into the medina is Chez Rachid. A fab traditional Moroccan restaurant which will source the best options from local restaurants to give you the most authentic experience. Coffee from one place, bread from another – given the restaurant was so small I’ve no idea where they got the actual meals from haha! Was good though, and there’s set menus on offer too if you’re looking for a good deal. For coffee and a good view, I recommend Cafe Clock again. 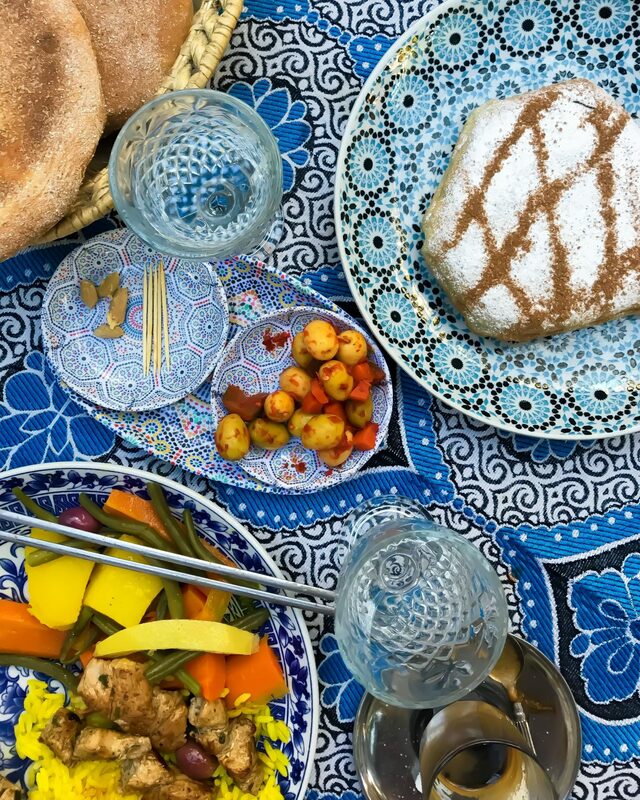 It has the same menu as Chefchaouen, so not cheap for food but with its rooftop terrace it’s a great way to see the city from up high, across the snaking alleys of the medina. 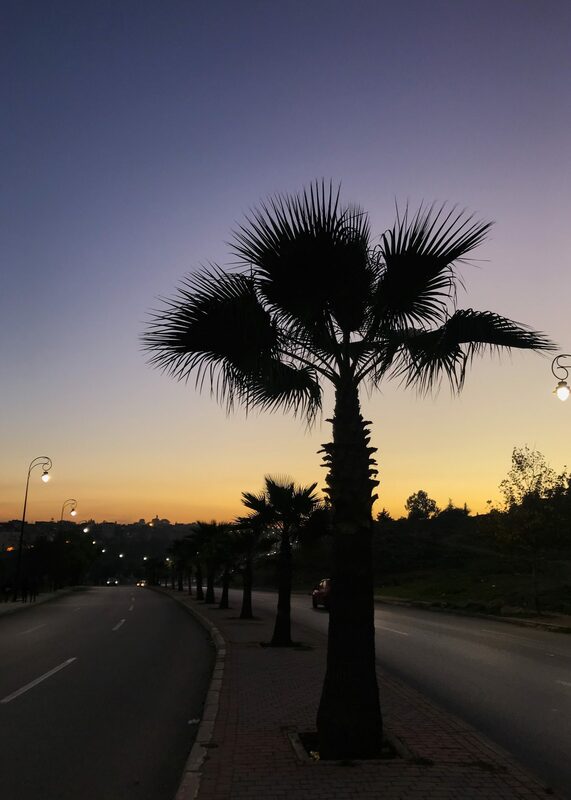 Where to go for sunset? 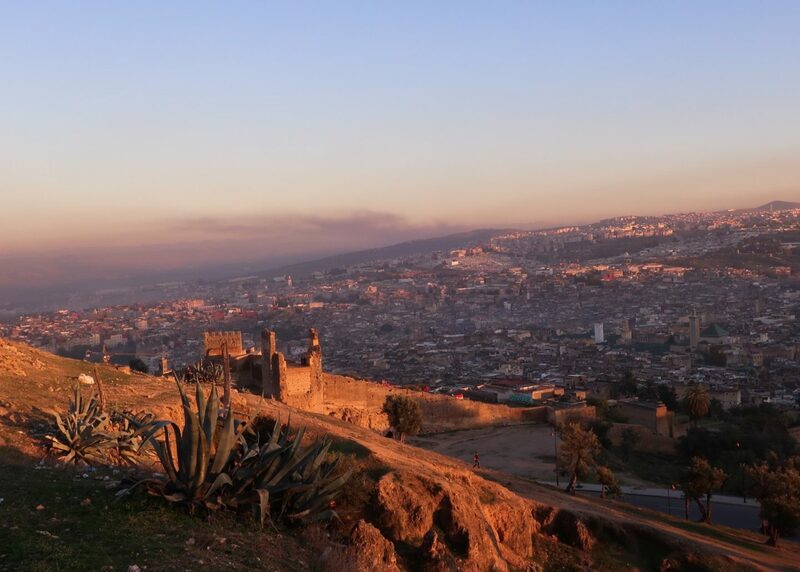 The guide to Fez hotspot for a view over the city during sunset, is the Marinid Tombs. Go outside of the medina, via the blue gate and head around and up via the main road for about 20 mins. You can see the whole city and amazing views across the mountains too. Really awesome and there’s usually a few people there too so it’s a sweet vibe. Have you visited Fez? What would be in your guide to Fez? Getting Naked at Moroccan hammam, fancy it?